The Delphic Quartet was born from four friends in love with the most classic forms of chamber music. Employees of various symphony orchestras, chamber groups and specialized in historically informed performances, they embarked on their journey alongside the great classical and romantic first, the discovery and study of the Italian repertoire for string quartet. Passionate readers and researchers of treaties and sources, like live need to run on original instruments by looking through the performance practices of the time, their own identity. 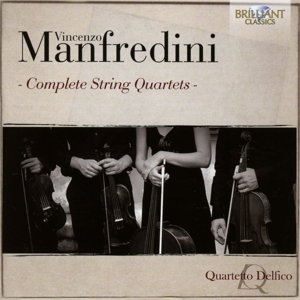 After you register, in a previous training, the 6 quartets of Peter Nardini, is a forthcoming cd with 6 quartets of Vincenzo Manfredini, both for the label Brilliant Classics in 2013 before recording mondiale.Dal involved in the project &quot;Quartets Italy &quot;programs performing live unedited manicured by IASM (Abruzzese Institute of History of Music). In May 2013, the quartet Delphic played live from the Quirinal to the Sunday concerts of Radio 3, and has also been present at the Ravenna Festival, the exhibition EstateAwaiting (BG), in various concerts in Florence, Viareggio, Teramo, Atri and Matera. As a base String Ensemble Delphic, mixed group created to expand the repertoire for wind instruments and double bass, were selected as Jeune Ensemble in residence Ambronay, performing at the Festival 2013 with the Schubert Octet in F major.